Here you will find advice, tips, and information about club activities. Stay informed and in the know and visit here regularly. There is also an RSS feed available. Here you will find advice, tips, and information about club activities. Stay informed and in the know and visit here regularly! You can also subscribe to email notifications or use the RSS feed to be notified when new items appear. This is to advise of the upcoming Annual General Meeting of the Mordialloc Social Running Club Inc. We would love to see as many members as possible attend this important club event. The Annual General Meeting is an opportunity to report to the members on the achievements of the club over the previous 12 months. Reports will be given by the President, Treasurer and Secretary. Another important function of the meeting is the election of the 2018/19 committee. We encourage members to be involved in the club in both official and unofficial roles. If you are interested in (or considering) nominating for a committee position, please contact Jim Poussard (President) on 0450 379 810 who can outline the various roles and the election process. Please note that only 2018 current financial members of the club are eligible to nominate for a committee position and to vote. Every year MSRC charge a small annual membership fee in order to assist the club with running costs such as promotion, social events, first aid and equipment. Membership is valid from 1 April 2018 – 31 March 2019. This April we are again offering an early bird membership special: Annual MSRC Membership for only $40. This year on top of the existing benefits every earlybird membership also receives a free running t-shirt! We ask all our current members to sign up or renew their membership and continue to be a part of this great local community club. The wait is over! 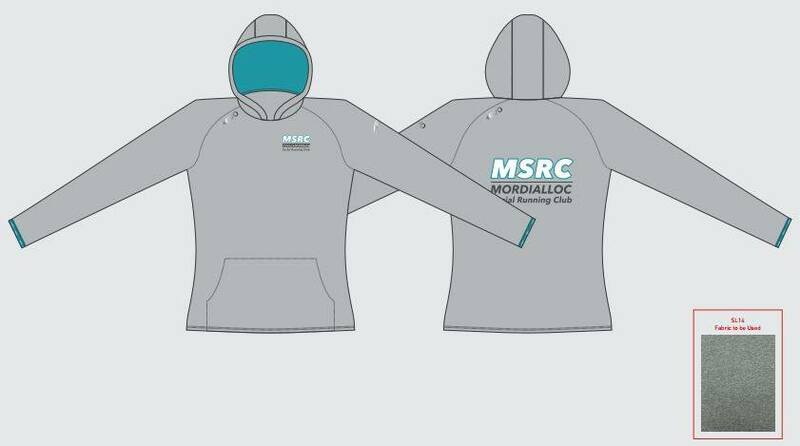 We are now taking orders for our fantastic high-quality EvoSports MSRC Hoodies – you will be too cool for school at your next running event or in your own home! We have kept prices really low – well below cost price – this is your membership fees at work. Your order will not be confirmed until payment has been made into the club account or cash handed to a club committee member or run group leader. Remember orders must be finalised by Thursday 30 November. Let us know if you have any questions. This is to advise of the upcoming Annual General Meeting of the members of Mordialloc Social Running Club Inc. We would love to see as many members as possible attend this important club event. Another important function of the meeting is the election of the 2017/18 committee. We encourage members to be involved in the club in both official and unofficial roles. If you are interested in (or considering) nominating for a committee position, please contact Jim Poussard (President) on 0450 379 810 who can outline the various roles and the election process. Please note that only 2017 current financial members of the club are eligible to nominate for a committee position and to vote. The Mordialloc Social Running Club will be providing weekly yoga classes specifically tailored to runners. Yoga is a great way to improve balance, stability and recovery. It is a great compliment to running: quiet, calm and meditative. It stretches tight muscles, helps improve breathing and encourages mindfulness. First session is this Thursday 20th, 8 - 9pm at the Allan McLean Hall, Mordialloc. Please print your tickets and bring them with you on the night for proof of purchase. Any time there is a new item on this page a summary will be sent to you automatically on a daily basis. You will not receive more than 1 email a day and only when there are new updates. Thank you! Check your email for details on how to activate your subscription. You may need to check your junk mail folder if you have not received a confirmation email within 5-10 minutes.